AllegroMedical.com presents The Veridian Pediatric Pulse Oximeter. The Pediatric Pulse Oximeter is intended for pediatric use; fits finger. A simple solution when you need to monitor oxygen levels and pulse rate in little fingers. 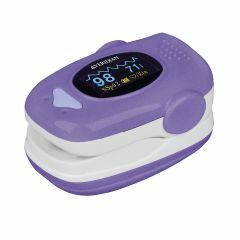 Veridian Healthcare Pediatric Pulse Oximeter has a large LCD display with adjustable brightness and two display orientations, a low battery indicator and auto shut-off.